Everyone knows that high IQ is no guarantee of success, happiness, or virtue, but until Emotional Intelligence, we could only guess why. Daniel Goleman's brilliant report from the frontiers of psychology and neuroscience offers startling new insight into our "two minds"--the rational and the emotional--and how they together shape our destiny. 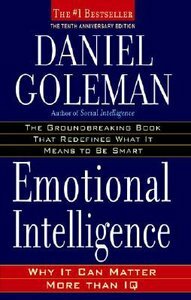 ^Through vivid examples, Goleman delineates the five crucial skills of emotional intelligence, and shows how they determine our success in relationships, work, and even our physical well-being. What emerges is an entirely new way to talk about being smart. ^The best news is that "emotional literacy" is not fixed early in life. Every parent, every teacher, every business leader, and everyone interested in a more civil society, has a stake in this compelling vision of human possibility. Psychologist Daniel Goleman was born on March 7, 1946 in Stockton, California. He earned a Ph.D. from Harvard. Goleman wrote his first book, "The Meditative Mind" after studying ancient psychology systems and meditation practices in India and Sri Lanka. Goleman wrote about psychology and related fields for the New York Times for 12 years beginning in 1984. In 1993 he co-founded the Collaborative for Academic, Social, and Emotional Learning. He is also a co-chairman of The Consortium for Research on Emotional Intelligence in Organizations and a member of the Mind and Life Institute's board of directors. Goleman has written several popular books, including "Emotional Intelligence," "Social Intelligence," and "Ecological Intelligence." He received a Career Achievement award for journalism from the American Psychological Association and was elected a Fellow of the American Association for the Advancement of Science to recognize his efforts to communicate the behavioral sciences to the public.